The creators of The Inbetweeners have reunited to create a comedy for the BBC about Premier League players. It is the first show Iain Morris and Damon Beesley have written together since the hit E4 series and two films. “We’re hoping to show viewers the hilarious inner lives of three young men who just happen to have a very stressful job in the public eye,” they said. The six-part series with the working title Afternoons will air on BBC2. The players are described as “boys from around the world who are far less proficient with women, money and social media than they are at scoring goals”. The show will focus on their friendship and their “mostly off-the-pitch misadventures”. 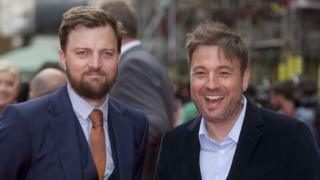 Shane Allen, controller of BBC Comedy, said having the duo “back together on a new scripted piece is about as good as it gets in comedy”. “We’re delighted to be working together again, and incredibly grateful to Shane Allen and the BBC for the faith they have shown in the idea,” the duo said. BBC Studios is developing, financing and handling international distribution rights for the series. Emmy award-winning producer Tom Werner, who produced Roseanne and who serves as chair of the Liverpool Football Club, is one of the show’s executive producers. “I have been friendly with Iain and Damon for quite a while, and I have longed to work with the two of them as they are such brilliant comedy writers. I hope my experience with Liverpool can provide some authenticity and humour to what is a very exciting format,” he said. The Inbetweeners ran on E4 from 2008 to 2010 starring James Buckley, Blake Harrison, Joe Thomas and Simon Bird. The award-winning show was beloved by fans and spawned two hit films but a recent 10-year reunion show was criticised by fans for its awkwardness.